When you cover a song that's not in your native language, like "Jai Ho,"make sure you are pronouncing the words correctly, especially when you're singing that song with it's original singer, A.R. Rahman. It makes for a REALLY annoying listening experience when you keep singing /jay ho/. It's not /jay ho/ ... it's jai... rhymes with eye. If you're that confused, just listen to the guy that sings it before you in the track. Follow him. He's the original. He knows what he's doing. I've been obsessed with a tv show. I must say, this has been difficult, since I get only 10 good, basic channels. But at my workout place, I stumbled upon a new show on MTV called Taking the Stage. The show follows 5 kids (3 dancers, 1 actress/dancer, and 1 singer/songwriter) in a creative arts high school in Ohio. As I'm watching the episodes on MTV.com, I find myself getting incredibly jealous that these kids get to play music in the hallways (something I would've done), have dance-offs in cafeteria during lunch hour (something I would've watched), and wear cool scarves with their outfits (something I've been in to). But alas, with my master's degree complete, high school is a distant memory. But if I could go back... creative arts school, here I come. Although, I'm thinking it probably wouldn't helped me get into college for speech-language pathology. Whatever... I would've been a star. 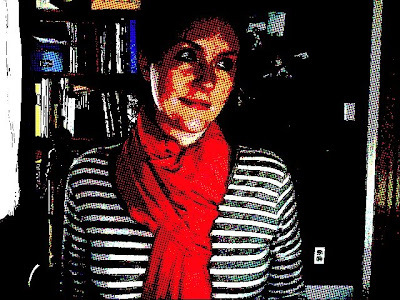 My newest spring trend for this fashion season (because I'm SO into fashion seasons *eh hem*) is the scarf. It all came about yesterday when my forever friend and I were perusing Goodwill. So now, I just have to figure out how to wear them. But after a bit of googling, I came across this site, which was very helpful. Who knew there were so many different options? Amazing. on Roscoe can be found here. It's my first attempt at writing a bio from a dog's point-of-view. Yes, it had to be done that way, so don't judge. At a pretty lean, mean 28 lbs.... meet Roscoe. He's still a puppy at 1 1/2(ish), but he's a brutus of a boy, compared to our little girl and even our Henry. But Roscoe is a lover. He kisses. He wags his tail. He plays nicely with everyone. He's one great dogger. He'll make someone very happy. If you read a few posts back, you could probably tell that I was getting the itch to have another pupster. I'm not completely crazy... I know three dogs are a lot. But there are just so many that need love, so many that need good homes. I can give both. But, Randy had the voice of reason (this time) and talked me into fostering. I think it'll be a great thing. 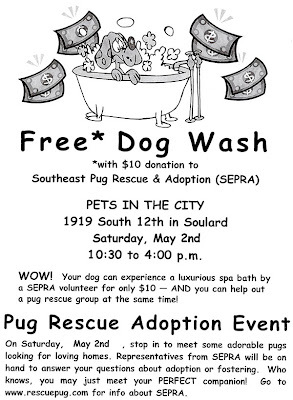 I chose to join up with Southeast Pug Rescue Association (SEPRA). They are a large organization based out of Georgia with a smaller sect in Missouri. And, after a home inspection set up for tonight, Randy and I will most likely be foster parents to our first pug... a boy named Roscoe. Actually, some lady he's staying with currently re-named him Cadbury, like as in the candy egg. Cute. But not really. So, he'll be Roscoe once more when he joins our family. I'm excited and a little hesitant. He was living outside 100% of the time, which for pugs is a BIG no-no. Because of their shortened snout, they don't have the ability to survive extreme temperatures or weather conditions. 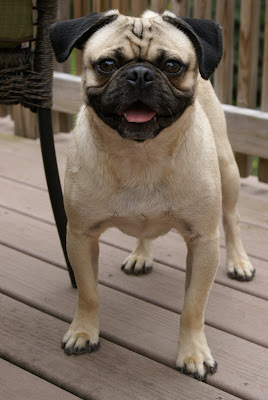 And, because he was an outdoor, neglected pug, he got hookworms. He's currently being treated for that. Following that treatment, he'll get neutered. The boy is getting the whole kit & caboodle of treatments! I'm thinking there'll be some potty training and belly banding on our part, but that's nothing we haven't already done with our pooches. I keep reminding myself and Randy that this won't always be convenient, but it's for a good cause. Every dog deserves the best. And at our house, they usually get the best. We can't help it. We love pugs. So, check back for updates. I'll probably be using this blog for updates and advertising, just in case someone is looking for the perfect pooch to love in a forever home. Today was my work out day. I've been trying really hard to eat healthfully and exercise more. And, I've been pretty inspired by our new workout facility (the flat screen TV on each cardio machine with 70+ channels that we don't get at home is VERY inspiring), but I witnessed something today that made me want to throw up more calories than I burned on the treadmill. I'm walking on my treadmill, doing an hour of cardio, when some petite lady with bleach-blonde hair piled up in a big, messy bouffant ponytail hops on a treadmill next to me. She starts running and continues to do so for about 5 minutes. Then, she hops off, and probably continues to flit around the place doing an eye-blink's worth of exercise. This is the kind of lady who probably looks great with a ton of makeup to cover up her red splotches and premature aging lines from over tanning. And guys probably go ga-ga over her after they've had a couple drinks and are in a darkened room because she's got a nice body but her face is harsh, to say it nicely. Although, honestly, in her defense, what she is smoking is probably WAY worse than anything that could be on the parking lot. I guess a few thousand germs from the concrete really won't hurt as bad as the deadly poison she is willingly sucking down her throat. Hm. I guess that's why she could only last 5 minutes on the treadmill. Lately, I've been bored. In my spare time, I've started surfing the internet. 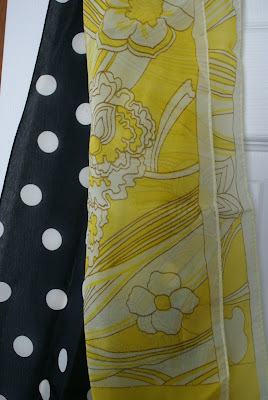 I do my daily rounds... friends' blogs, craft websites, and facebook. One thing that I added to my rounds is dog rescue sites. Maybe it's because my forever friend is looking at getting a pupster, or maybe it's because I just feel so dang guilty that good dogs have been in bad places, but a soft spot in my heart has gotten bigger. And it leaves me asking... what's one more? We already have 2 doggers, and legally, we could have 1 more. That's one more saved from a life in a cage. I liked something like this one, this one, and this one. After entertaining the idea, I start thinking... what type of dog would we get? Another pug? A bigger dog? We have a fenced-in yard. We have an SUV. It could happen. But then, my dream comes crashing down with the reality of 3 dogs. More food. More vet visits. More, more, more. Ahh... (don't worry, Mom) it's just an idea. Can I speak with Ella Phant? Co-worker: Randy, can you give this lady a call? She's been trying to get ahold of you and asked me to have you call her. Randy: Hm. Her name isn't in the system. I don't remember her. What car does she have? Co-worker: I think it's a Mercury. She said she'd be at this number all day today. Randy: Okay. I'll call her. So Randy promptly dials the number in hopes of speaking to this woman about her car. Woman on the phone: St. Louis Zoo. How can I help you? Randy: Can I speak with Ella Phant? Woman on the phone: Click. Hm. I guess Elephant wanted to take her business else where. And yes, Randy only got the joke AFTER the lady at the zoo hung up. Happy April Fool's Day!